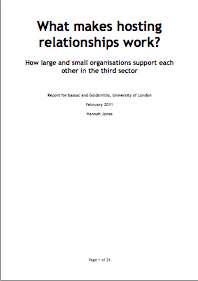 The Contribution of Volunteering to Community Cohesion This report describes research undertaken as part of the Taking Part? ESRC Research Cluster, focused on community based learning and active citizenship. It contains findings from a community based research project undertaken in partnership between researchers at Lincoln University with community groups in the Abbey ward in the city of Lincoln, UK. 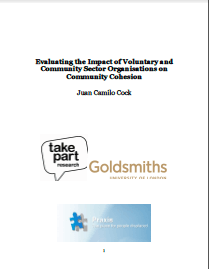 The research used an experiential learning process co-producing knowledge about the value of volunteering in terms of contributions to community cohesion by discussing what nurtures and motivates volunteering, and barriers and opportunities experienced by community groups. Using a mutual reflection and constructed conversations approach, the research project support learning processes to empower people in having a wider participation in their communities. It is building upon the existing learning experiences and volunteering activities. Recent Evolution of Active Citizenship A in EnglandThis scoping exercise identifies continuity and change in the environment for active citizenship learning in England, since the change of government in 2010. It maps key initiatives in the range of learning opportunities for active citizenship available between 2010-12 and draws out key elements of continuity and change apparent in their structures, learning approaches and the models of participation they promote. Intergenerational learning and social solidarity This research report draws on the experience of a group which was working to build social solidarity by working across generations. 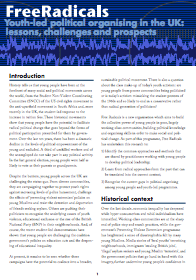 In the context of current government policy and the Prime Minister’s stated aim of creating a ‘big society,’ it was timely to consider the role played by intergenerational practice in the development of active citizenship. This report is the result of a research project conducted by Goldsmiths College, in close collaboration with Voluntary Action Islington. Building on a previous project within the Taking Part Programme, we set out to investigate how small community organisations might measure their impact, emphasising a practical approach to the actual doing of measurement, rather than setting out a prescriptive framework. TUC Swords of justice and civic pillars The report examines five case studies where unions have developed community networks to organise vulnerable workers, encourage activism, improve access to learning and employment support, strengthen social cohesion and generally promote the benefits of trade unionism. These cases are analysed to assess the advantages and ingredients of successful community engagement. TAKING PART CASE STUDY – Stream Arts This report explores how long-term participative and collaborative arts projects are engaging local communities in creative responses to local political, economic and physical changes and how the experience can be used to strengthen active citizenship and community empowerment. More Than Measurement This report looks at the need to develop an effective quality standard tool based on continuous reflection for faith-based organisations, one of the largest and fastest growing contributors to civil society and the UK Third Sector, in order to measure their impact and encourage their participation in the wider Voluntary and Community Sector (VCS). This report focuses on how active citizenship and community empowerment can be encouraged through community arts, drawing on the lessons of community theatre making led by intergenerational research, and how the impact of projects can be evaluated to improve participatory arts in south east London. This report looks at the growing trend for self-regulation initiatives to encourage and certify good practice in UK Third Sector organisations and why empowering service users should be the main objective. Here we Stand: Inquiry into Local Activism & Dissent The findings of a UK wide inquiry into activism and dissent, exploring: Where can resistance and alternatives to injustice be found? Where are the homes for such action? National Coalition for Independent Action (NCIA) and Manchester Metropolitan University (MMU). Young Heritage Detectives CBC report This report presents the findings of an evaluation of the long term impact of ‘The Young Heritage Detectives’ project, co- ordinated by The Children’s Society, Rochdale , which had worked on issues of cultural identify with young refugees and asylum seekers in the Rochdale area of Lancashire. Surviving Thriving or Dying, ESRC-CAEC Project Document This report presents findings from a study which explored the changes in small CVS groups across the North West, and their resilience needs and strategies that help their survival. Learning – Volunteering Community Cohesion in a Rural County This report presents an analysis of volunteering in the two case studies reinforcing the importance of local volunteers in improving community cohesion. Aspirations and Engagement CBC report 2012 This research solicited the views of community members and young Black men aged 14-19 in South Manchester, on issues relating to young Black men’s aspirations through exploring their participation attitudes towards education, employment, and training as well as opportunities for volunteering. It sought to identify strategies for enabling the effective participation in culturally specific personal development programmes in areas of masculinity, racial identity, emotional literacy community and citizenship. Was it worth it? This report presents the findings of a research study undertaken as a collaborative effort between Greater Manchester Centre for Voluntary Organisation (GMCVO) and Manchester Metropolitan University (MMU) between March-July 2010 as part of the ‘Taking Part Capacity Building Cluster (CBC). The study aimed to develop understanding between academia and the third sector by facilitating an extended period of engagement between the two organisations, via a research fellowship placement. This report provides valuable insights into the varying ways in which the organisation could develop a holistic research strategy. What makes hosting relationships work? Dan Firth, with FreeRadicals Organisation Ltd., a youth-led organisation promoting self-organisation amongst young people, working in partnership with Goldsmiths. 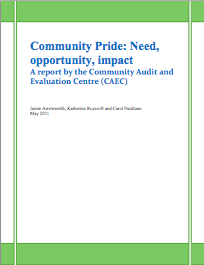 Community Pride This research study was undertaken over a 3 month period in 2010 and was funded by the ESRC as part of the “Taking Part Capacity Building Cluster‟ (CBC) (2008-2012) whose remit is to develop innovative approaches to community engagement and empowerment.